Usually, you may not even guess how many duplicate files exist on your Mac and the significant space they take up on your hard drive. Manual searching for duplicates is not so easy and takes up so much time. 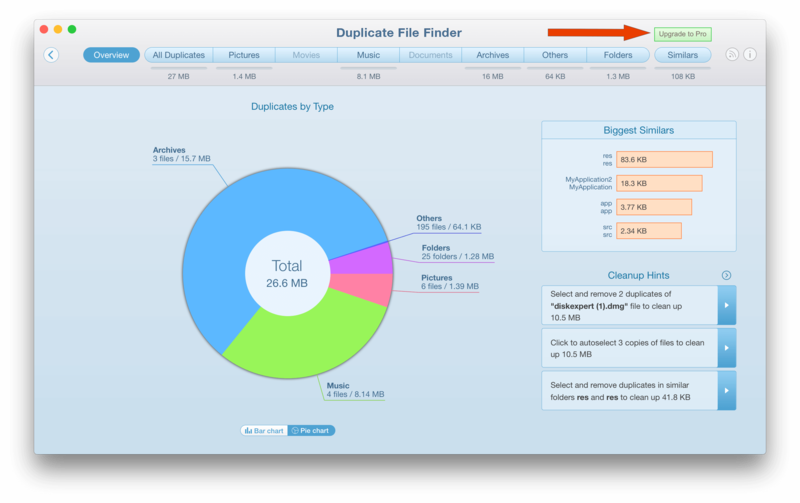 That’s why we have created Duplicate File Finder, designed to help you quickly find and remove completely identical files that may be located in different places on your Mac or external drive. Duplicate File Finder is free to download from the App Store. Also, the application provides a Pro mode that is available with in-App Purchase and gives you more possibilities for a quick duplicates cleanup on Mac. Let’s take a look at a list of features for both application versions. Support of any drive type. Can scan folders, hard drives and even network drive. Removal not only of duplicate files, but copies of folders as well. As you can see, the free version of Duplicate File Finder is enough to get rid of useless data copies and easily remove duplicate files. While the free mode suits users who don’t have too many duplicates, the Pro version is recommended for those who may have tons of duplicates and need the most efficient application version. 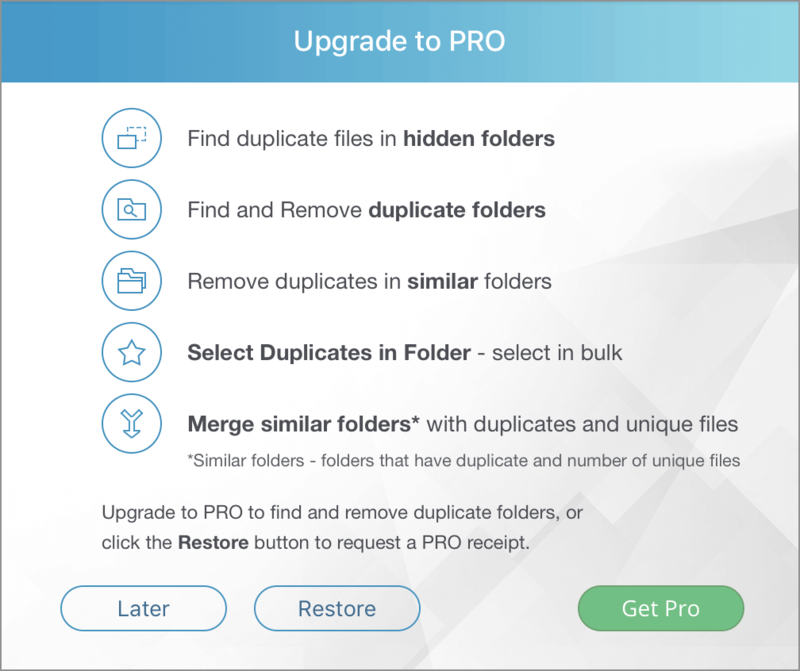 Thus, after upgrading to Pro, the cleanup process is even faster with smart hints, ability to delete duplicate folders at once and find even hidden duplicates. Let’s go a bit deeper into these features. It may happen that you have different folders that are completely identical. 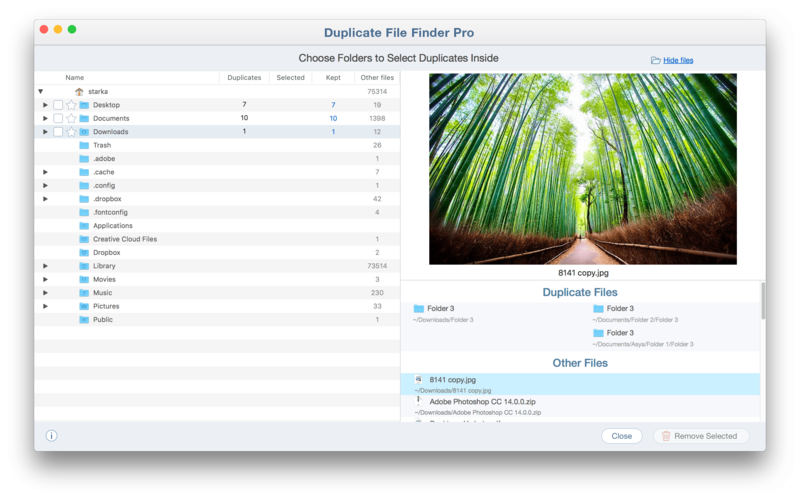 While with the free program mode you need to select and review each duplicate file in the folder separately, with the Pro mode you can select the entire duplicate folder. You thus spend less time on the cleanup process and use it more efficiently. Use the merge option to easily organize your files and don’t leave any duplicate space eaters behind. When you merge folders, the application moves or copies unique files from one folder to another. As a result, merging similar folders allows you to combine dozens of duplicate files and folders, making the structure pretty much easier. You can compare folders and select all duplicates at once in one of the folders. You save your time and no more need to review and select each duplicate file separately. 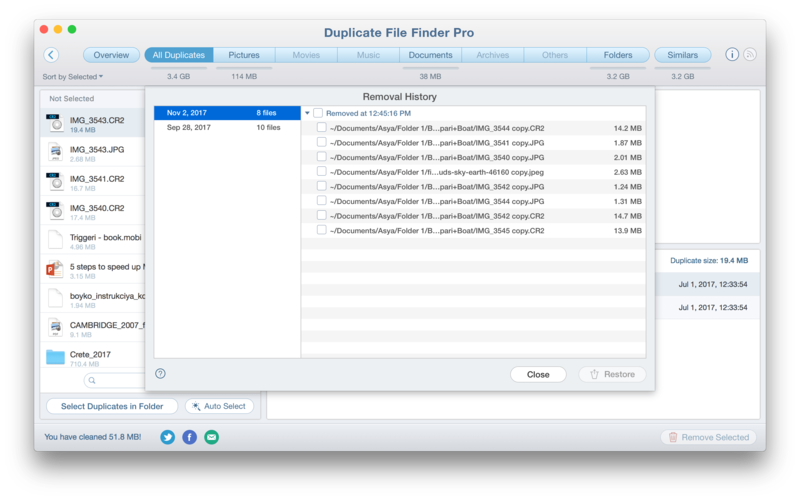 Duplicate File Finder provides a list of removed duplicates. You can view groups of duplicates by date and deletion sessions. If the files are still be in the Trash folder, you can restore them. For this, select files you want to recover and click to Restore. You should know that there are files on your Mac that may be hidden. These may be system hidden files or files that you have previously hidden from prying eyes and forgotten about. With our professional duplicates searcher, you can find even hidden duplicate files. Launch the application and scan any folder on your Mac. When the scanning is finished, you will see the window with the results. Click the green Upgrade to Pro button. In a pop-up window that appears, click the green button. Then you will see a default Appstore login window. Fill the fields with your Apple ID information and confirm the purchase by clicking the Sign in button. Congratulations! 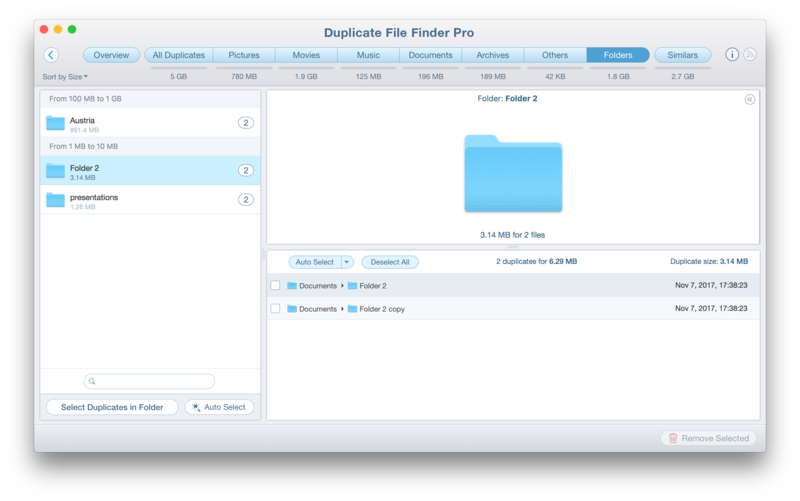 Now you can enjoy the full PRO version of Duplicate File Finder. *Note, if, after the purchase the app hasn’t upgraded to Pro, you should restore the app. It may sometimes happen because of an unstable internet connection or Apple Service needing more time to process the transaction. Just reboot your Mac → go again to Upgrade to Pro → and click the Restore button.